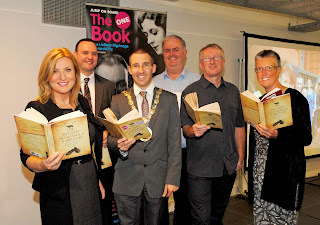 I supported the Libraries NI The Health in Mind One Book Initiative on Thursday 12 September 2013. The scheme is supported by Action Mental Health, Aware Defeat Depression, Mind Wise, Cause, Public Health Agency and Libraries NI. Helen Osborn (Director of Library Services, Libraries NI), Lynda Bryans (Aware Defeat Depression Patron), Colin Bateman and Mayor Muir were present at the event. The Unlikely Pilgrimage Of Harold Fry as chosen as the One Book to promote understanding and awareness of Mental Health issues and importance of well-being. I found the book and event extremely valuable way to engage in positive discussions about mental health and wellbeing issues. For far too long we have considered mental health matters taboo subjects. By reading the book and engaging in open conversations we can hopefully realise ambition arising from The Unlikely Pilgrimage Of Harold Fry to “do something out of the ordinary, take a journey, renew contact with someone, look at strangers with a new perspective.